Today is the 4th of July, which is also the day of a uniquely Alaskan running race, the Mt. Marathon. The name is slightly misleading, as it is not, in fact, a marathon. But while it’s only ~3 miles long, the course runs up ~3000ft in 1.5 miles and then you turn around and go straight back down. I’ve never participated, but the course is reputedly extremely steep and rough, with competitors routinely finishing the race not just muddy, but bloody. I’ve highlighted the men’s and women’s course records with black outlines. Note how long the men’s record has held up! One thing this graph makes fairly clear is that the men’s times have been essentially flat for the past three decades. This means that while someone may come along and set a course record, the men’s winning time isn’t likely to trend downward for the foreseeable future, but will continue to bounce around 45 minutes or so. Any new record is unlikely to signal a new downward trend, rather just part of the “statistical noise” around the apparent limit of ~45 minutes or so. 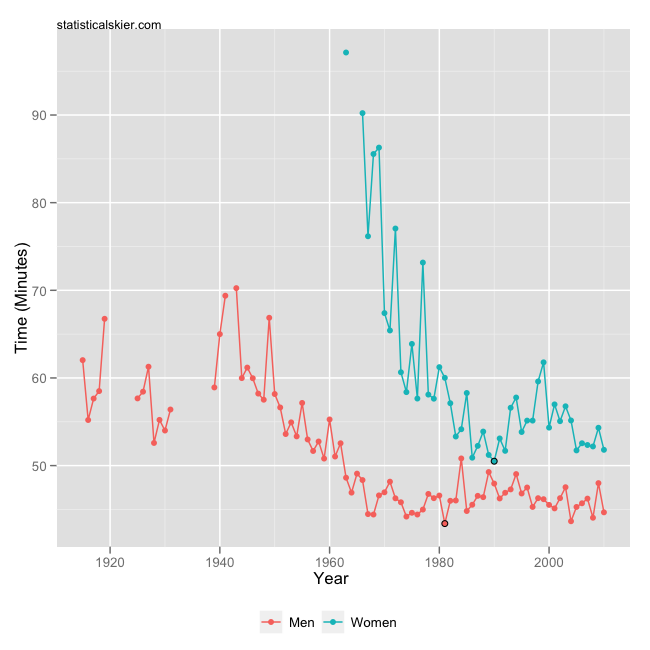 The women’s times have also been fairly stable since the early 1980’s or so, but considerably less so than the men, although the women’s record has held steady for quite some time as well. One of the reasons I love data like this is that it highlights how close to the limits of human performance athletics can take us. Given the population of athletes that the race is attracting, the stability of the winning times for such a long time suggests that the winners are completing the course fairly close to the limits of what’s physically possible for a human. Again, it’s possible you might see the winning times drop noticeably if the race started attracting new sorts of people (elite European mountain runners, perhaps), but these times might already be as fast as you can get. In any case, good luck to everyone participating today! Posted by Joran on Monday, July 4, 2011, at 6:00 am. Filed under Fun Stuff, Running. Tagged mt. marathon, records, running. Follow any responses to this post with its comments RSS feed. You can post a comment or trackback from your blog.